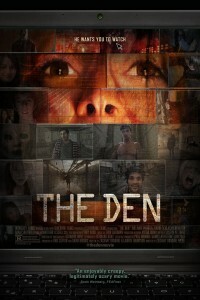 After receiving a grant for her graduate thesis, Elizabeth Benton (Melanie Papalia) logs onto a video-chat site known as THE DEN, on a mission to explore the habits of its users. During one of her random video-chats, Elizabeth watches in horror as a teenage girl is gruesomely murdered in front of her webcam. While the police dismiss it as a viral prank, Elizabeth believes what she saw is real and takes it upon herself to find the truth. Her life quickly spirals out of control as she gets pulled deeper into the darkest recesses of the internet. And eventually, Elizabeth finds herself trapped in a twisted game in which she and her loved ones are targeted for the same grisly fate as the first victim.